Stroll Gardens: Stroll gardens contain all the elements that make up the Japanese garden: streams, ponds and waterfalls; stones and bridges; pathways and a wide variety of plants. See photos. 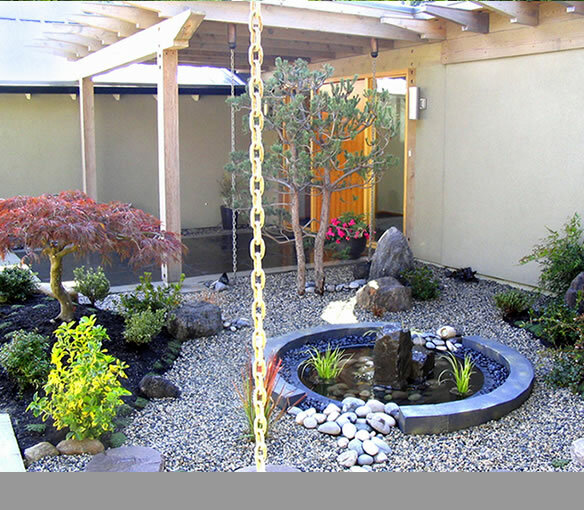 Zen-Style & Courtyard Gardens: Zen-style gardens have mainly rocks and sand with vegetation such as slow-growing evergreen bushes or moss. A courtyard garden ("tsuboniwa") is usually enclosed by walls or hedges and is an extension of your living space. See photos. Indoor & Entrance Gardens: Indoor gardens captures the beauty of nature right inside your home. The sound of water and carefully chosen plantings is a welcoming prelude in any Entrance garden. See photos. Sacred & Urban Space Gardens: Sacred Spaces & Healing Gardens are a prefect oasis to rest and contemplate. Urban patio spaces can be transformed into a contemporary-style courtyard garden. See photos. Commercial Gardens: Zen Gardens have been commissioned to create Japanese style gardens for hotels, airports and other commercial spaces.See photos.